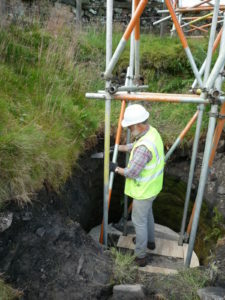 Works at the Prosperous Lead Mines scheduled monument initially focused on the smelt mill. In November 2014, the archway was shored to help secure it over winter, before the main consolidation work could take place in the following spring. A photogrammetric survey of the upstanding remains was then carried out, providing a detailed record of the walling and also a 3D model. An ecological assessment and a bat survey was also undertaken to ensure consolidation works would not affect any protected species. In Spring 2015 the arch was stabilised, and the wall repointed. The exposed wall head were consolidated with hard and soft (turf) capping. 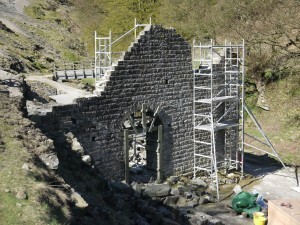 During the summer of 2015, the small sculptural fragment of the engine house was also stabilised. In July 2016 work was carried out to stabilise the top of the Prosperous mine shaft and to secure it with a metal grille. The Landscape Partnership is grateful for additional support from Harrogate Borough Council, the local gamekeeper and landowner.